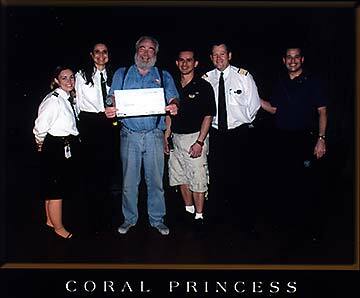 During his final show of the 2005 cruise season, Buckwheat Donahue was presented with a check for $1,000 from members of the Coral Princess crew. The money was raised during a special crew-only gambling night on board the ship. Buckwheat performed Robert Service poetry on several cruise ships this past summer, and is available to perform fund-raisers during his walk for the Heartbeat Trail and other worthy causes. Buckwheat Donahue's Heartbeat Trail walk and paddle is a fund-raiser for Skagway's Dahl Memorial Clinic, so it may acquire equipment that can help residents and visitors to our community. Buckwheat had several heart episodes in Oct. 2003 while passing through Juneau, Alaska. He was able to get to a hospital in time, but if he had been home in Skagway, he may not have survived. After that episode, he committed himself to walking, not only for his health, but to raise awareness for others, and to give something back to his community. He walked from Skagway to Whitehorse (110 miles), and then from Whitehorse to Dawson City in the Yukon (another 450 miles), and on Oct. 1 he began the Heartbeat Trail, a cross-continental walk and paddle that will take him from Florida to Alaska. Donations can be made to the Heartbeat Trail through the Community Development Services fund of the Skagway Development Corporation. The EIN for SDC-Community Develop ) non-profit] is 20-0122259; the DUNS number is 147372630.